PNGS, Inc. – Your business partner to success! Are you one of the Millions Marvel Cinematic Universe fanatics (like me) that can’t wait to watch their upcoming 2nd part of the Trilogy movie Avengers: Infinity War? Did you watched already their 1st Movie? How many Marvel Cinematic Universe you already watched? 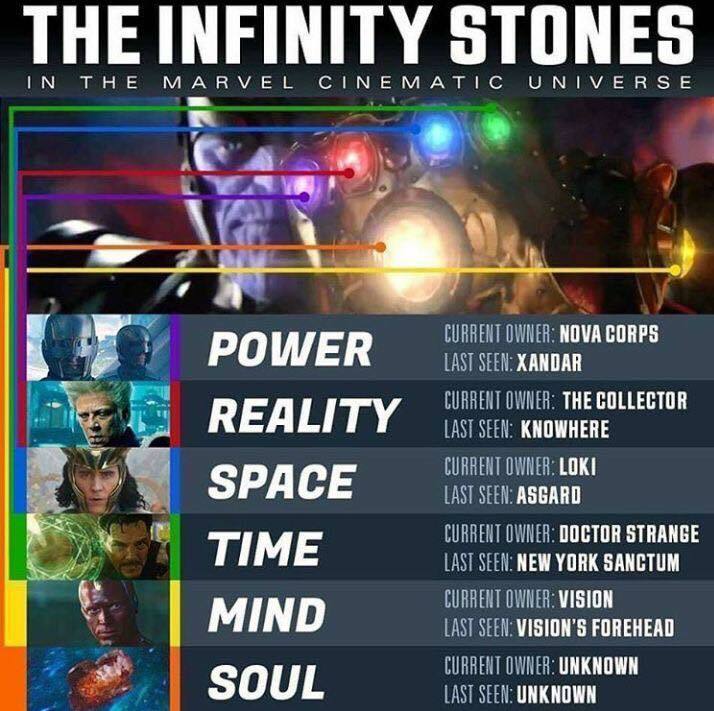 Who’s who the recent holders of the powerful Infinity Stones before THANOS decided to collect them all in the 1st part of the trilogy movie? Very easy to understand the story of this movie if you followed and watched all (or some) of the Marvel Cinematic Universe movies or if you’re a Marvel Heroes Big fan right but how about other peoples that don’t really know the Marvel and didn’t watch yet any previous Marvel Cinematic movies. How they will understand and catch up to this latest Marvel Cinematic movie franchise? WORRY NO MORE, with these reasons I made a researched and put it in one article the summary of the entire Marvel Cinematic Universe movies that linked or connected to the Infinity Stones for everybody’s to catch up the real story and score about this upcoming trilogy movies Avengers – Infinity War. they are six singularities that existed before the Big Bang, that were compressed into the Stones after the universe began. Each Gem is shaped like a small oval. Each Gem is named after, and represents, a different characteristic of existence, and possessing any single Gem grants the user the ability to command whatever aspect of existence the Gem represents. The Gems are indestructible but not immutable. On two occasions, one or more of the Gems have appeared in the form of deep pink spheres that are several feet in diameter. On other occasions, the Gems have appeared in their small oval shape but with different coloring (i.e. the Soul Gem being red colored when worn by the Gardener). In the Ultraverse, after merging into their original form of Nemesis, the Gems were again separated after a battle with Ultraforce and the Avengers. Housed in the Tesseract, it first appears briefly in the Thor post-credits scene. In Captain America: The First Avenger, it is used by the Red Skull to power weaponry developed by Hydra, and in The Avengers it is shown to be capable of generating wormholes, which Loki uses to transport the Chitauri to New York City in an attempt to conquer Earth. After the Avengers repel the invasion, it is returned to Asgard for safekeeping. In November 2013, producer Kevin Feige confirmed that the Tesseract was the Space Stone. In The Avengers, Thanos gives Loki a scepter that allows him to control people’s minds and to project energy. The scepter falls into the hands of Hydra leader Baron Wolfgang von Strucker, who is shown in the mid-credits scene of Captain America: The Winter Soldier to have been using it to experiment on humans. The only surviving subjects of those experiments are Quicksilver and Scarlet Witch, in whom superhuman abilities were unlocked. In Avengers: Age of Ultron, the scepter is revealed to contain the Mind Stone, and has an artificial intelligence that grants sentience to the computer program Ultron, who then incorporates the stone into his “Vision”, an android. The Mind Stone can also enhance the user’s intelligence, grants the user immense knowledge, and can create new life. Formed by the Dark Elf Malekith into a fluid-like weapon called the Aether, it is said to be able to destroy the Nine Realms and return the universe to its pre-Big Bang state. The Asgardians entrust the Aether to the Collector at the end of Thor: The Dark World to separate it from the Tesseract, as they consider it unwise to have multiple Stones close together. The Aether, when bonded with a host, can turn anything into dark matter, and is capable sucking the life force out of humans and other mortals. The Power Stone is contained within an orb that Ronan the Accuser seeks to find for Thanos in Guardians of the Galaxy. Direct contact with the Power Stone will result in the holder being vaporized. It is capable of destroying entire civilizations, and Ronan tries to use it to destroy the planet Xandar. The Guardians of the Galaxy stop him and entrust the stone to the Nova Corps for safekeeping. The Time Stone was encased in the Eye of Agamotto by Earth’s first sorcerer, Agamotto. A Master of the Mystic Arts can use the Stone to alter and manipulate time. Thousands of years later, in Doctor Strange, Dr. Stephen Strange learns to use the Eye and uses it to save the Earth from Dormammu by threatening to trap the demon in a time loop until he abandons his plans for Earth. The Masters of the Mystic Arts retain possession of the Eye in their secret compound Kamar-Taj in Kathmandu, Nepal. The Soul Stone is shown in Guardians of the Galaxy to be orange. Feige stated that it would be seen “sometime in Phase Three, for sure. There’s a gauntlet that needs to be filled. A right-handed gauntlet appears in the film Thor, where it is stored in Odin’s vault; this gauntlet was later revealed to be a fake in Thor: Ragnarok. In the mid-credits scene of Avengers: Age of Ultron, Thanos is seen wearing a left-handed gauntlet. Copyright 2018 - Precious Nicole General Services, Inc.